The organisers aimed to make the Art Expo Malaysia a life experience and an educational event, with great entertainment value as well as a quality diversity in terms of media, styles, artists and geography - regional or as sovereign states (Ooi, 2010). I doubt the effectiveness of an art exhibition to local public's education, because visual aesthetic is not something that can be taught just through an art exhibition. Their target audience are those who are already has interest in art, and them who has potential to buy art. In the book Way of Seeing, data shown most of the population think art is a privilege for the rich, and people who visit to art museum are those who has higher education (Berger, 1977, p.24). Way of Seeing was published at 1977, in recent year's data of 2001, the result is almost the same as Berger's, which majority of art museum visitors has at least a diploma education, and for them the art museum is more likely to be a educative leisure, just like Ooi stated (Hanquinet and Savage, 2001). 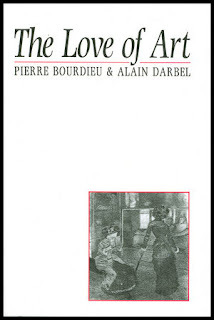 This report also led me to Bourdieu and Darbel's The Love of Art: European Art Museums and Their Public published in 1966, that studied the characteristics of small population who visit art museums. Diagram 1: This is the first systematic sociology study of art museums and their public. I will study on it later for essay writing. Therefore, target audience of Art Expo Malaysia is definitely not all the Malaysian public, but the specific group that has interest in creative field. In Malaysia History of Art from Scratch written by Malaysian artist Tan Chin Kuan, he stated that Art Expo Malaysia is a big-scaled art commerce event, but not a major activity that push the visual art field. I agreed that this art exhibition could not achieve art education for public, although it is free entry for everyone, because they are rarely get in touch of it. Therefore I shall focus on how an art exhibition influence the art or creative society. Berger, J. (1977) Ways of Seeing. United Kingdom: Penguin Books Ltd.
Hanquinet, L. and Savage, M. (2011) 'Educative leisure' and the art museum. Ooi, K.C. (2010) Art Expo Malaysia 2010. Selangor: Art Expo Malaysia Sdn Bhd. Tan, C.K. (2016) Malaysia History of Art from Scratch. Malaysia: Tan Chin Kuan. Bourdieu, P. and Darbel, A. (1966) The Love of Art: European Art Museums and Their Public. Reprint Edition. Cornwall: Politic Press.